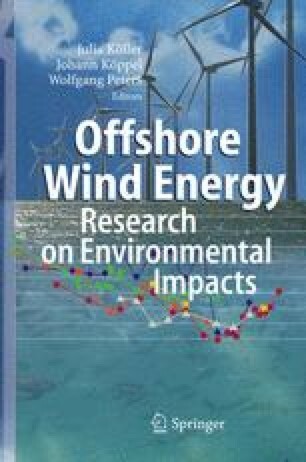 In conclusion, it is obvious that depending on avoidance behaviour and collision risk as well as on the proportions of populations affected, the impact of offshore wind farms in the German sector of the North Sea on seabird populations differs considerably. The example of Red-throated Divers and Common Guillemots shows that large parts of the German Bight would be excluded from use by these species. This has to be taken into account in the process of commissioning by authorities and should lead to the application of threshold levels in order to select wind farm sites which have least impact on seabird populations. The above examples demonstrate that in the assessment of the effects of a single wind farm, the habitat loss in addition to the habitat already lost before due to other wind farms must be considered. Therefore, this underscores the need for a cumulative approach when assessing impacts on seabird populations.